A marvellous comeback by Stromness saw them win the Maurice Walls Cup for the first time since 2005 in the final played at Picky on Monday 1st September. Trailing Thorfinn by 2-0 at half time Stromness scored 4 goals without reply in the second half to run out 4-2 winners. The first half was an even affair with a number of chances for both sides. Just when it looked like the match would end level at the break two goals in the last five minutes of the half put Thorfinn in the driving seat. After a run down the right Kalum Dalton was tripped in the box and Greg Scott converted the resultant penalty. Almost immediately Thorfinn went on the attack and won a corner. Oskar Stout met the corner from Scott Taylor perfectly to head Thorfinn into a 2-0 lead. Stromness made an excellent start to the second half with Sam Hunter firing a rocket shot from outside the box into the net to give them hope with only a couple of minutes played. Play then raged from end to end with both sides creating a number of chances in an exciting second half. It was Stronmness who were to draw level midway through the half when Drew Clark found himself free in the box to hammer home the equaliser. The momentum was now with Stromness with Sam Hunter firing a number of shots just off target. Five minutes from time another shot from Sam took a deflection off a Thorfinn defender to give Stromness the lead for the first time in the match. Two minutes later a Jamie Flett header from a Callum Crawford cross completed an excellent comeback and a fine victory for Stromness in what was a very exciting match with both sides creating numerous chances particularly in the second half. At the end of the match the Maurice Walls Cup and winners medals were presented to the winning Stromness team by sponsor Marty Flett. OYDG would like to thank Marty for his continued sponsorship of the competition and Gavin Leask for refereeing the match. The final will be played this coming Monday 1st September at the Picky Infield with a 6.15pm kick off. Thorfinn clinched the Merriman Shield Under 15’s league title when they beat nearest rivals East United 6-3 in their final match of the season played at Picky. Needing only a draw to win the league Thorfinn made an excellent start taking the lead after only four minutes when Morgan Foubister tapped in after a Kalum Dalton cross. After a push by a Thorfinn defender in the box East were awarded a penalty and Robbie Scott converted to level for East. Kalum Dalton restored Thorfinn’s lead but a minute later East equalised once more through an Archie McPhail free kick. On the 20 minute mark Thorfinn took the lead again with Oskar Stout hitting a long range shot in off the post. Just on the stroke of half time a low drive by David Coates increased Thorfinn’s lead as an exciting half came to an end. Thorfinn started the second half in a similar fashion to the first with Kalum Dalton scoring with a hard drive to put Thorfinn 5-2 ahead. Credit to East who kept plugging away and Robbie Scott pulled a goal back after 25 minutes. With 3 minutes of the match left Morgan Foubister completed the scoring for Thorfinn to complete an excellent 6-3 victory. Had it not been for a number of great saves by Craig Drever in the United goal the winning margin could have been greater. At the end of the match OYDG Chairman Stephen Crawford congratulated both teams and introduced Brian Muir representing sponsors Merrimans who presented the Shield and winners medals to Thorfinn. This was a good season for a free scoring Thorfinn who deserved their victory with only one slip up during the season in a 3-1 defeat against Stromness. 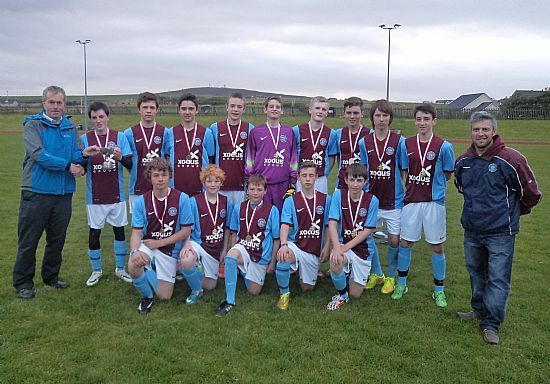 The Under 15's League kicks off on Monday 12th May with East Utd playing Stromness in Holm and Dounby playing Thorfinn in Dounby. The full fixture list for the season is available HERE. 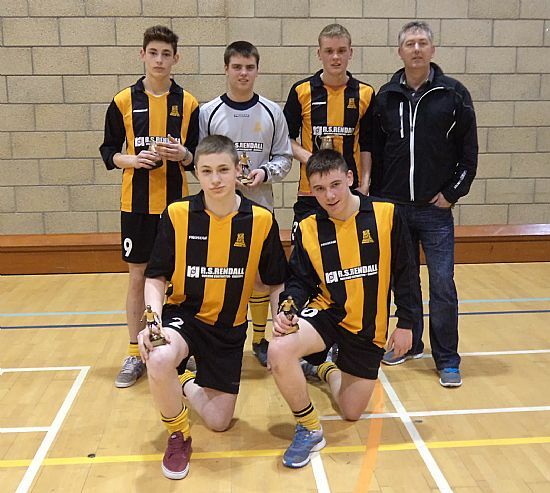 There was a dramatic end to the youth indoor football season as Rovers A faced East United A in the final of the S4 & Under Hourston Indoor 4’s played at Picky on Friday night (14th March). In a fiery match the Kirkwall side raced into a 3-0 lead before having a man sent off, and then survived a late comeback to hold on for a narrow 3-2 victory. East United went into the final as favourites having won all their group matches before edging out a strong Dounby A side in the semi-finals. Rovers had a poor start to the night losing their first match against a young Stromness C team but a crucial victory against Dounby A set them up for an impressive semi-final victory against East Utd B. East Utd started the final on top with Liam Delday hitting the post early in the match. 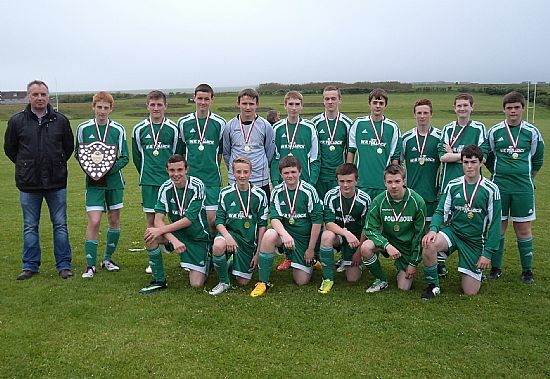 This spurred Rovers on and two quick goals by Ciaron Drever and Alex Griffiths took United by surprise. Worse was to follow for a stunned United as Griffiths added a second. However what was already a highly charged match boiled over as in the aftermath of the goal celebrations Griffiths squared up to Owen Harcus and foolishly pushed the East player leaving the referee with no option but to send him off. It was no surprise that East came roaring back into the match with Rovers playing with one less player. Liam Delday pulled a goal back and then added a second but time ran out and the final whistle blew with Rovers holding on for a narrow victory. Thorfinn A 6 Dounby B 0; East Utd A 3 Stromness A 2; Rovers B 0 East Utd B 3; Dounby B 1 Stromness A 3; East Utd A 3 Rovers B 0; East Utd B 1 Thorfinn A 1; Rovers B 2 Stromness A 0; East Utd A 3 Thorfinn A 0; Dounby B 1 East Utd B 4; Stromness A 0 Thorfinn A 1; East Utd B 1 East Utd A 6; Dounby B 1 Rovers B 1; East Utd B 2 Stromness A 1; Dounby B 0 East Utd A 6; Rovers B 0 Thorfinn A 0. East Utd C 1 Dounby A 6; Rovers A 1 Stromness C 2; Stromness B 0 Thorfinn B 1; Stromness C 0 Dounby A 1; East Utd C 0 Thorfinn B 1; Rovers A 6 Stromness B 0; Dounby A 4 Thorfinn B 0; East Utd C 0 Rovers A 6; Stromness C 1 Stromness B 1; Thorfinn B 1 Rovers A 3; Stromness C 4 East Utd C 2; Stromness B 1 Dounby A 4; Thorfinn B 0 Stromness C 4; Dounby A 2 Rovers A 3; Stromness B 5 East Utd C 1. Final: East Utd A 2 Rovers A 3.